Esthetics is a prime demand for patients who seek anterior replacement of missing teeth. Resorption of the alveolar bone of the edentulous area occurs if left untreated for a long time. It further leads to thinning of the labial cortical plate in the maxillary arch. Few other reasons for narrowing of the alveolar crest are anatomic such as congenitally missing teeth and pathologic, that is dental trauma from tooth avulsion. Nowadays, patients always look for a fixed alternative for the restoration of missing teeth. Other than a conventional fixed partial denture, dental implants are the first choice of treatment. It is one of the difficult tasks for the clinician as well as the dental technician to meet the expectation of the patient when the ridge defect is present in the edentulous area. Extensively invasive procedures such as guided bone regeneration for correction of alveolar defects lead to prolong treatment time and induce psychological trauma to the patient. Application of gingival porcelain can avoid extensive surgical procedure to rehabilitate missing soft and hard tissues. Artificial gingival restorations are better repair tools for managing maxillofacial defects and compensates for the present alveolar defects. Significantly, better esthetics results can be achieved by utilizing gingival porcelain. This case report describes the use of currently available gingival porcelain to meet the esthetic demands and avoid unnecessary two surgical procedures guided bone regeneration (GBR) and further implant placement. One male patient aged 31 years reported to the Department of Prosthodontics and Crown and Bridge with a chief complaint of missing right lateral incisor (12) since 3 years back [Figure 1]a. The patient presented with a history of extraction of 12 for carious broken tooth and did not get it replaced. After clinically examining the edentulous segment (12), it was found that the dentoalveolar defect was not that pronounced; however, there is a thinning of labial cortical plate. The tissues were in a clinically healthy state; hence, there is no point of going for a GBR procedure before implant surgery. Tissue deficiencies often needed bone augmentation procedures, which use a simultaneous or staged approach to regenerate lost volumes of bone for adequate implant placement. Reported ridge defect was classified according to the Seibert's nomenclature. When an intraoral clinical examination carried out, it was noted that the edentulous segment was not severely resorbed. Minimal deformity can be observed, and that is why it falls into Seibert's class “n” category. Hereinafter, we finally develop a treatment plan to first, perform an implant surgery in a conventional manner [Figure 1]b. Consequently, after 3 months of the healing period, the patient recalled for the restorative procedure. All the merits and demerits of the treatment explained to the patient and informed consent taken. A diagnostic impression for the maxillary and mandibular arch then made. Further, the diagnostic wax-up has been shown to the patient for simulation purposes. After getting the complete blood profile of the patient, the cast was sent to the laboratory for stent fabrication. Radiographic evaluation of bone height and bone-mapping procedure has followed to get the width of the existing bone. Thereafter, it was decided to place a one-piece implant (ADIN DENTAL IMPLANT SYSTEMS LTD, One™) which was indicated in the maxillary lateral incisor (12) region. After completion of the surgery, postoperative instructions were given to the patient, and prophylactic antibiotics and anti-inflammatory drugs have prescribed. The patient recalled after 7 days for suture removal [Figure 1]c.
After the recommended healing period, the patient turned up for further restorative procedures. First, we exposed the implant-abutment region (12) with electrocautery. Then, minor preparation of the abutment done by the high torque rotary handpiece, as in a one-piece implant, the abutment continues with the body of the fixture. In the meanwhile, provisional restoration in the right maxillary lateral incisor region fabricated. Little amount of pink acrylic (Lucitone 199, Dentsply international) has been used to cover the ridge defect. The extension margins with pink acrylic were smoothened and polished so that it should not impinge the underlying tissues. After that, it was tried inside the patient's mouth for verification of marginal fit and occlusion, then cemented using a temporary luting agent (Temp-Bond Kerr) [Figure 2]a. The final impression was made using polyvinyl siloxane material (Aquasil Dentsply) and send to the laboratory [Figure 2]b. The mandibular impression was made using alginate impression material (Neocolloid, Zhermack) and bite registration (Zhermack Occlufast Rock) taken for the same. It was planned to give porcelain fused to metal (PFM) crown with gingival pink color porcelain extension to cover the alveolar defect. Coping trial performed and utmost care has given to shade selection so that the final prostheses should be esthetically acceptable [Figure 2]c.
Bisque trial has been done inside the patient's mouth, and the patient consent was taken before the final cementation of the prostheses. After performing all the necessary adjustments for occlusion and adaptation of the definitive crown, the final cementation was done with self-adhesive resin cement (3M ESPE Rely X™ U200) [Figure 2]d.
In a current scenario, dental implants are considered to be the most viable treatment option for better functional as well as the esthetic requirement of the patients. Nowadays, one-piece implants with transmucosal abutments are the clinician's choice for replacing maxillary incisors areas. Due to its ease of placement and hygiene maintenance studies in the literature suggested for restoring minor ridge defects in the maxillary anterior region. The authors have concluded that flapless implant placement and providing an immediate temporary crown in situ ations involving the maxillary anterior region represents a viable treatment modality in suitable clinical situations where esthetics are of primary concern. In the past few years, one-piece implant became more popular in the maxillary incisor region for achieving optimal esthetics. Restoring the minor ridge defect with gingival color porcelain on the cervical area of the PFM crown is a most feasible alternative. When the gingiva-colored ceramic applied to the crown, the path of insertion of the crown and adjacent teeth may limit the cervical extension of porcelain toward gingival embrasure spaces. In contrast, the application of gingiva-colored ceramic on a prepared abutment allows a gingival embrasure space to fill where interproximal papillae are missing and allow for the creation of a natural appearance, as well as fewer limitations from the contours of the adjacent tooth. In this report, the patient turned up with the complaint of missing lateral incisor replacement and a high esthetic demand. Decision made after the clinical and radiographic evaluation to replace the incisor with one-piece implant insertion. After the surgery, immediate provisional crown with pink color self-cured acrylic resin added to the cervical area of the crown to cover the defect. Final PFM crown with gingival-colored porcelain extension delivered to the patient. The prosthesis was functionally and esthetically acceptable to the patient. Instead of going for a more time-consuming procedures such as fabrication of Andrew's bridge and anterior loop connector, one-piece implant insertion with immediate temporization, and the final use of gingiva-colored porcelain in a PFM crown considered a most feasible option. The authors would like to thank the laboratory staff members and technician of the Department of Prosthodontics, Saraswati Dental College and Hospital, Lucknow, for their support. Buses D, Dahlin C, Schenk RK, editors. Guided Bone Regeneration in Implant Dentistry. 2nd ed. Chicago: Quintessence; 1994. Seibert JS. Reconstruction of deformed, partially edentulous ridges, using full thickness onlay grafts. Part I. Technique and wound healing. Compend Contin Educ Dent 1983;4:437-53. Kaurani P, Kaur RS, Padiyar M, Kumar N. Prosthodontic rehabilitation of a case with an anterior ridge defect using Andrews bridge. Indian J Dent Sci 2013;2:100-3. Gökçen-Röhlig B, Atalay B, Baca E, Işik D, Meriç U. Prosthetic rehabilitation of a patient with a mandibular defect caused by a gunshot wound. J Craniofac Surg 2009;20:1614-7. 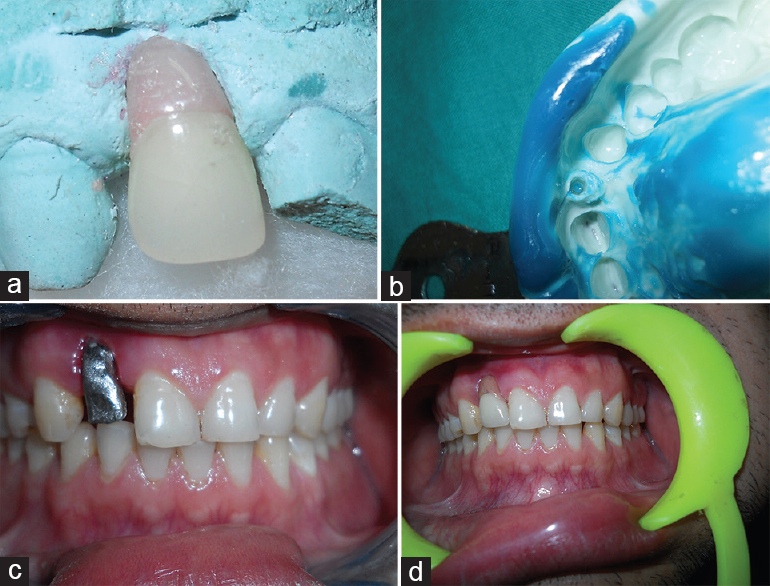 Frank RP, Brudvik JS, Leroux B, Milgrom P, Hawkins N. Relationship between the standards of removable partial denture construction, clinical acceptability, and patient satisfaction. J Prosthet Dent 2000;83:521-7. Misch CE. Maxillary Anterior Single – Tooth Replacement. St. Louis: Mosby; 2005. Andrews JA, Biggs WF. The Andrews bar-and-sleeve-retained bridge: A clinical report. Dent Today 1999;18:94-6, 98-9. Sadig WM. Bone anchored Andrews bar system. A prosthodontic alternative. Cairo Dent J 1995;11:11-5. Rai R, Menaga V, Prabhu R, Geetha KR, Suprabha R. A prosthodontic management of severely resorbed anterior ridge defect – A case report. J Clin Diagn Res 2014;8:15-7. Wiens JP. 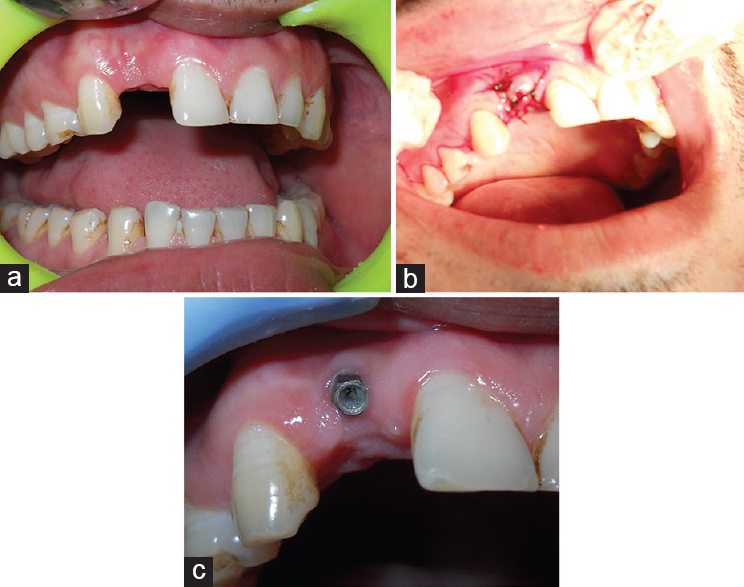 The use of osseointegrated implants in the treatment of patients with trauma. J Prosthet Dent 1992;67:670-8.